The sky is the lightest part of the landscape and should not get darker than a 7 or 6 on the value scale because the sun and sky are the two light sources that we have outdoors and therefore it follows that nothing can get lighter than the light source itself! So following this rule gives us the luminosity in a landscape. The next important concept in painting skies are the gradients that we find because of the warm yellow color of the sun and the cool blue of the sky. There are two gradients going on in the sky one going darker and cooler away from the sun and the other going lighter and warmer from zenith to horizon (from top to bottom). In this case, sunlight is streaming in from the left hand side, so the blues go from warmer and lighter to cooler and darker left to right. Also, the sky changes from a slightly violet blue to a slightly green blue top to bottom. So this is what I am trying to establish here in the first washes. 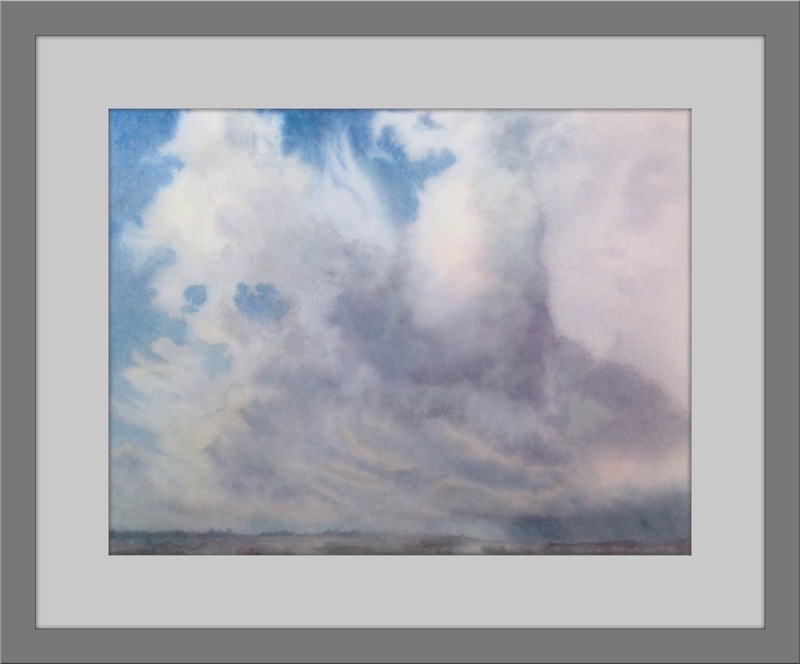 The light areas of the clouds receive the light of the sun and are warm, I have placed pale tints of yellow on the left one and going towards slightly orange on the right one. The half tones and shadows donot receive the direct light of the sun rather get the cool light of the sky from the opposite side and therefore are cooler going from a warm blue to almost dull violets, I`ve even placed some red violet for color interest. After that it gets a little tricky: due to atmospheric perspective, from zenith to horizon, the light areas of the clouds go warmer and darker and cloud shadows go cooler and lighter, so the contrast gets decreased towards the horizon and the tones sort of all merge together to a pale warm tint and this gives the illusion of depth and distance. The ground is of a value only slightly darker than the sky because when the sun is overhead , the ground is perpendicular to it and receives the most amount of light. I let the colors of the sky flow into it and added some dull greens and reds for buildings and trees, and a lighter portion for the canal. So these were the things I was trying to concentrate on in my first cloudscape painting , also trying to achieve a moody and atmospheric quality by being looser with the brush and also looking at warm cool relationships and also and also ………heeeee das wars dann. Thanks for looking , I hope you liked it and see you next time with a sunset sky! Tschüss!! Hi everyone , I`ve just started working on a cloudscape painting and I want to share it here as it progresses, with you all. Here is the rough sketch that I`ve going for now, looking at the overall design and for the underlying rhythms in the forms. It`s based on a photograph that I had taken at midday lighting conditions in the Netherlands some time back. The viewpoint is high overlooking the entire city but the structures looked too busy, so I`ve left in only a thin strip of land showing to bring home the contrast between the huge cloud formation and the tiny buildings and canals. It had started forming within minutes before our very eyes and the day transformed suddenly from bright and sunny to heavy downpour but not before leaving me with beautiful pictures! The colors have been dropped in after the leaves have been wet twice (priming, Susan Harrison). This allows the area to dry slowly so that usually the leaf can be completed in one wash. This one`s facing the light so its very light valued. Follow this link to view the video; the first 3 mins where the base wash is applied have been deleted to fit in with the 10 mins utube requirement: Enjoy! I didn`t quite realize at the beginning how complicated this was. You work for hours and and at the end of the session see that except for a small area the rest of the paper is blank! Well, I like doing it this way actually. I like getting lost in all the little details that nature creates. The background foilage is a little scary. The midground and the background and any layers in between have to recede visually so that you don`t have to watch your carefully done foreground areas disappearing into a maze. It`s useful to see a thumbnail or a slightly bigger image of the photo once in a while to get an idea of the overall form. Here the flowers on the extreme left are farthest away going around to the back so I made them paler and not so warm, the ones next to them are a bit more brighter till the nearest ones which are the most saturated. I used a number 5 da vinci brush even for the slender stems and buds, using a small detail one would mean you would have to refill the brush many times more. And oh, thats a tiny hummingbird that I added! 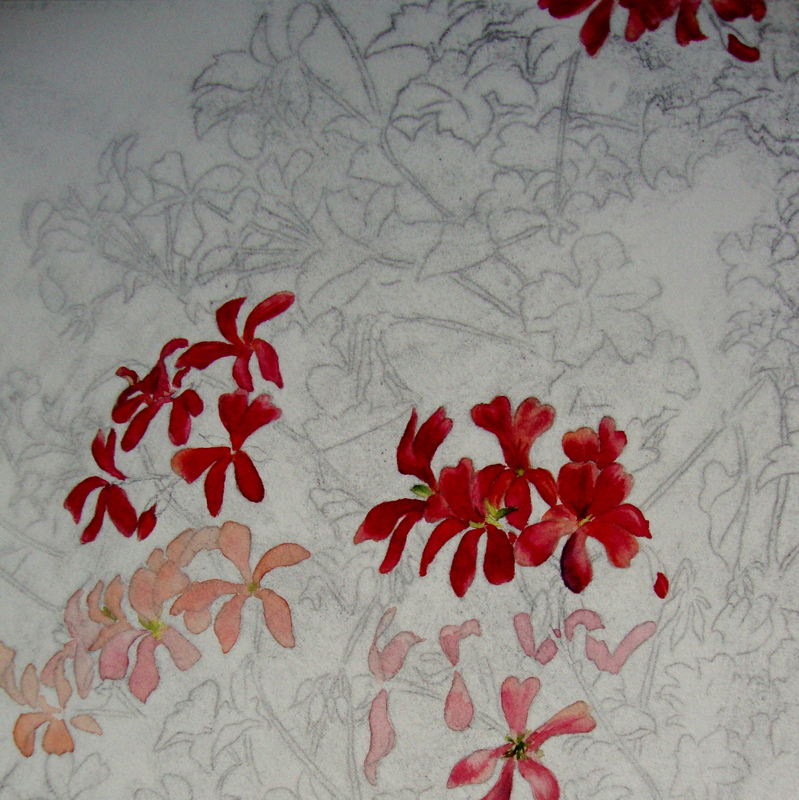 These were painted in two washes in various shades of red and orange. They are named `Spiritual Happiness` and that is just what I had four days back on the day of Maha Shivarathri when I had been fasting and chanting `Om namah Shivaya`. If you practice awareness … on the breath or on the thoughts for example, you could instead practice it with repeating some words of power, whichever ones you feel an affinity for. You will really see the difference. 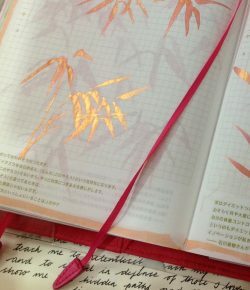 The sound of the mantra acts like a sword cutting through knots of resistance, showing the light behind, glimpses of mystery and magic from beyond which we so crave for in our day to day life. Although this flower is popularly known by the name Geranium, the scientific name Geranium refers to a completely different flower. I love this plant, it blooms so profusely throughout the summer with very little care and the foliage smells just heavenly. I just found out that it is cultivated for its citrus, mint, rose and fruit scents in the perfume industry. 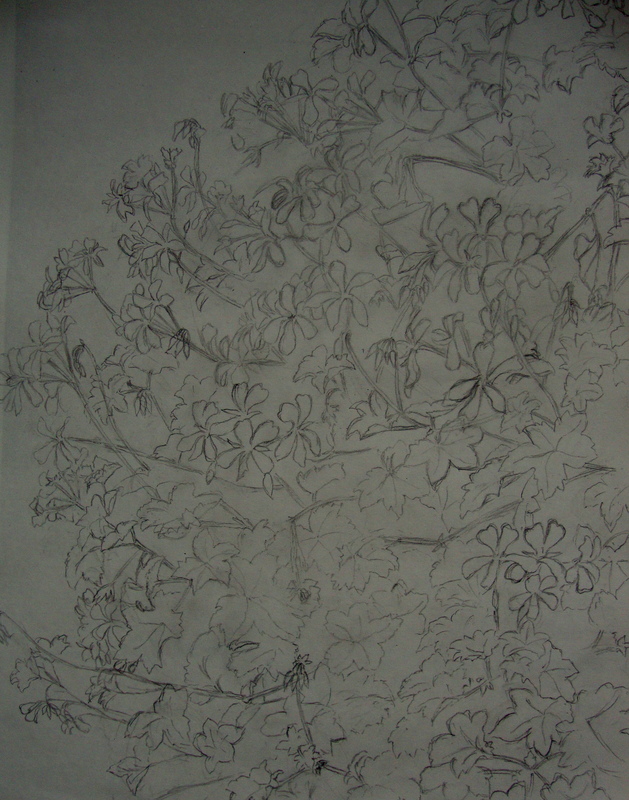 This is a portion of the drawing for my next painting. 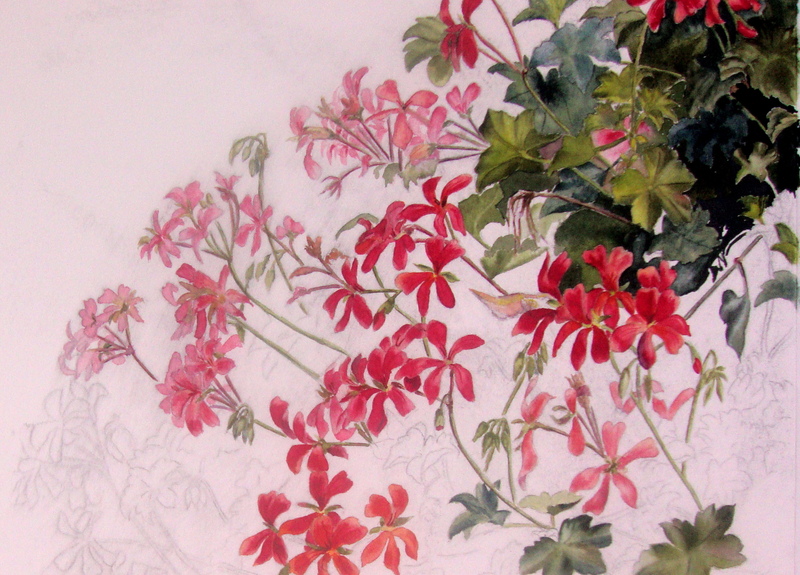 I`m still not sure about what color scheme I want in this one, though in real life these flowers are pink. 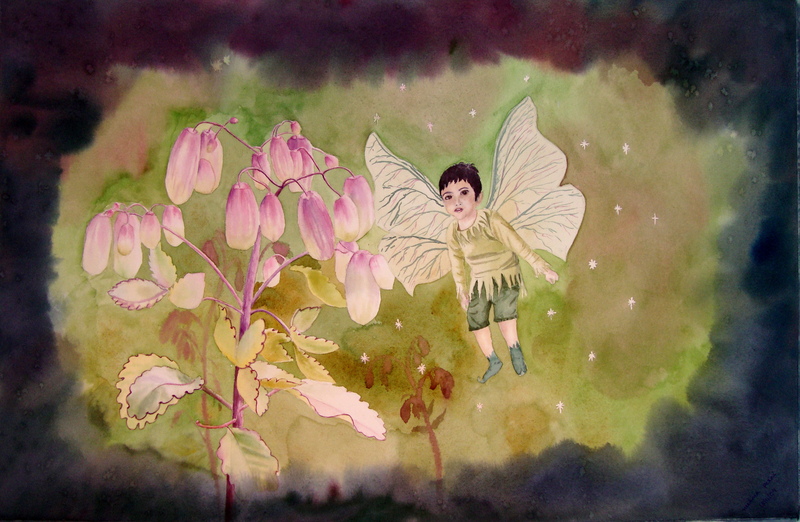 This plant is Kalanchoe pinnata ( the buds aren`t open in this drawing) named `Light in Fairyland` by the Mother. 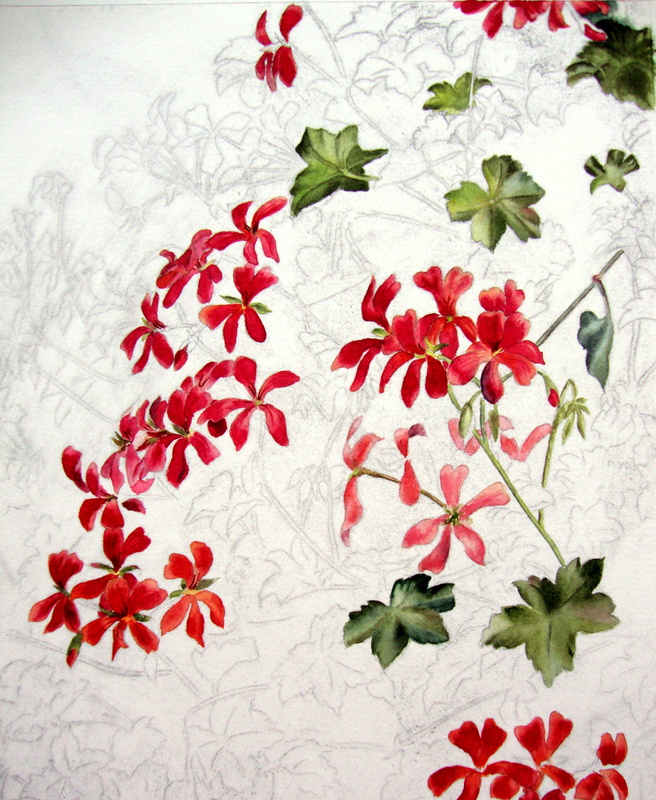 There is another flower of the plant Kleinhovia hospita named `Joy in Fairyland` which I might include in here as the painting progresses. Mailmeri blu burnt sienna, Winsor & Newton perylene maroon, Scminke ultramarine blue for the roof, S sap green, Daniel Smith pthalo green (BS) for the foliage.